The analysis side of the work is always the hardest part that we have to do. Our Year 10 students have started their NCEA Level 1 courses already, so they are now the Year 11's on their JumpStart four weeks at the end of the year. Part of what I have set up for my group is some analysis exercises using SOLO as the structure to support it. I have broken the questions down into slowly increasing depth using the SOLO levels. 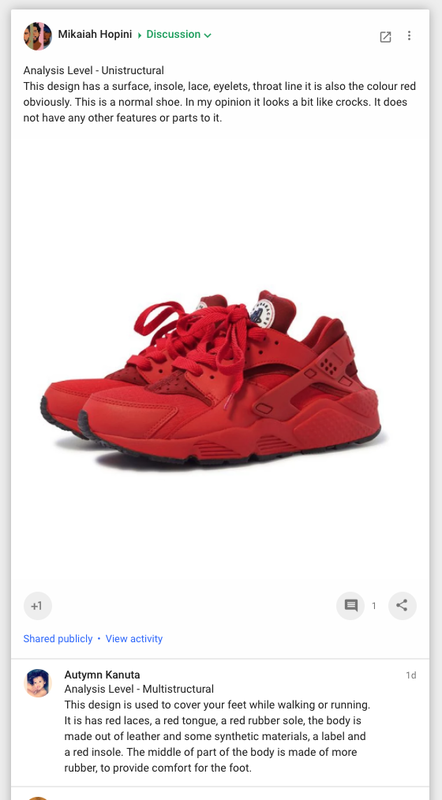 The exercise that we did first this week to start us off was to find a picture of a running shoe and post it into the class Google Plus Community. The notes they had to write with their post was answering the questions on the Unistructural page. They then had to write a comment on someone else's post answering the questions on the Multistructural page. I did this first / with them to give them some confidence. This is their first time in this class doing work in the community where everyone can see it. There was a little bit of nagging involved for some of them as they were hanging back, waiting, not posting. I have found this is normal as I have used the Google Plus communities for a couple of years now with my classes and they are always a little shy at first. They get over it fairly quickly when they realise that there is no judgement on what they post and we are helping each other out. Here is an example of what we did on Friday. We only had a single period so only did the first two levels. Come and visit the community of you want to see more. As usual there is a post that is "outside of the box".. !! This year, I have been focussing a lot of time in breaking down the NCEA Design and Visual Communication standards. This came as a result of a slightly more "challenging" moderation report. I have split the breakdown into achieved, merit and excellence, listing what all the words and terms mean (the standards are not written in the most student friendly way to be honest!! ), what they will do in the project to cover this and then where the resources are on the site. This has been, first of all, extremely helpful for me to ensure that I am offering project tasks that allow the students to access excellence. It is then helpful for the students to know what the standards mean and what they have to do in their project work to ensure they are covering everything. Promote an organised body of design work to an audience using visual communication techniques. selecting and presenting the features of an organised body of work to an audience. Research pictures and information about your chosen architect. Highlight which key pieces of information you will use in your poster design. Use thumbnail sketching techniques to start to design the layout of your poster. Develop your design work using a computer application - making sure you are using a few examples of the designers work, not just one. Analyse the effect you have created with your layout developments. Produce a final poster using Adobe Illustrator. Write a final evaluation analysing your final poster. Clearly promote an organised body of design work to an audience using visual communication techniques. purposefully selecting and applying techniques to ensure layout, composition and visual impact are appropriate to the context of the brief and audience. Composition - how the design is made from separate parts and how they work together. Explain why you have chosen the images you have on your designs. Produce a write up that summarises the life and style of the architect’s work. Analyse your thumbnail sketches as to how you have arranged your layout. Use design language in analysis of work. Explain how design elements have been used to achieve the design developments. Final design is very clear to understand, to read, to see. It gives a clear explanation of the architect’s work to someone else. This level also depends on the quality of your work and on you showing your understanding of your Architect. Effectively promote an organised body of design work to an audience using visual communication techniques. communicating a high quality presentation that is convincing, shows accuracy of layout, visual impact, and precise execution of techniques. convincing - the evidence is there that your architect’s work has been taken into account in the layout of your poster. accuracy - correctly laid out, with no errors. Analyse the key points of the architect’s work and use these to explain their style. Use the style of the architect’s work to influence the design of the poster. Use design elements well in the layout of the design work. I have been rewriting my Level 2 DVC course from scratch and have decided to include 2 Generic Technology standards to work alongside the DVC standards. The work I have been doing this week on the first technology standard has been greatly helped by breaking the standard down in this way as it is my first time working with this standard. It has made it very clear in my head what we have to do. Undertake brief development to address an issue. producing a final brief comprised of a conceptual statement and specifications. development to address an issue. reflecting ongoing feedback from key and wider stakeholders. List the social and physical environment elements that the design will be made for in order of importance. Give reasons why they are in this order. brief development to address an issue. justifying the specifications in relation to the physical and functional attributes required for an outcome. While writing the specifications, link them to the physical and functional attributes that you have stated already. We are starting Jump Start for our Year 10 students in 2 weeks. This is where they stop being Year 10's and start on their NCEA courses. They have done their options and with the seniors having left for exams, the timetable changes to next year's. I have decided to make a new site dedicated to jump start. I am designing it to be full of work and exercises that will give them the skills to get through Level 1 Design and Visual Communication. Sketching and rendering are important drawing skills to take them through any of their design projects. The research and analysis tabs are the two areas that are key to getting their achievement up into the merit and excellence levels. The Google Plus Community is our place where we work together and support each other. Ako Ngatahi is a new idea for next year. I want the students to start making the how to's and rewindable learning elements, as well as me. How we present this is up for grabs at the moment - blog, site YouTube channel - I haven't quite decided. This site is a work in progress at the moment but if you want to take a look, here is the link. I've got another week to get it complete.